This year Council is constructing a shared path from Croome Road Sporting Complex to Albion Park Railway Station. 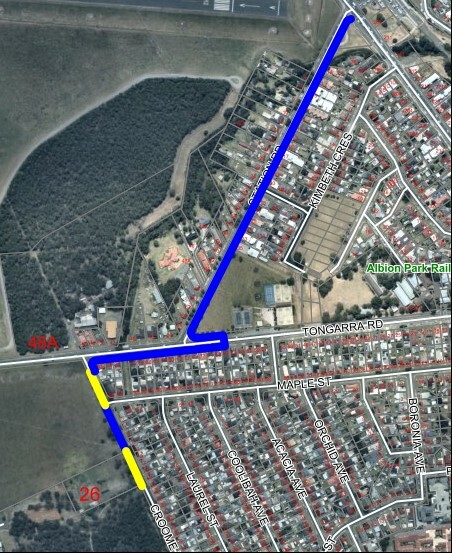 A new shared use footpath is proposed from Croome Road Sporting Complex to Albion Park Station. The 2 km footpath will link the train station, sporting complex and residential areas providing greater pedestrian safety and accessibility. As part of the Capital Works Program 2018/19, we are constructing a shared path from Croome Road Sporting Complex to Albion Park Station. This work is a portion of the Shellharbour Local Government Area Shared Use Path Strategy adopted in 2010. What is a shared use pathway? Many of Shellharbour ‘cycleways’ are really pathways for the use of pedestrians, strollers, rollerbladers, skateboarders and cyclists. They are officially known as ‘shared use pathways’ and are for everyone to use. Shellharbour residents are encouraged to show care and courtesy on our shared paths. How long will the work take and when will work start? The work is proposed to commence late-May 2019. Generally, the hours of construction will be between 7am-5pm Monday to Friday and 8am-1pm Saturdays. The work will take approximately three months to complete, subject to weather conditions. The roads in and around the area of work will remain open but motorists are advised to travel with caution. Pedestrian access may be restricted in short intervals, signage will be in place. The work will be done in stages and access will be restored as quickly as possible. Residents that are directly neighbouring the new shared path will be disrupted in short intervals. Some driveways may be restricted for up to 7 days, however Council will notify owners and residents prior to undertaking work on driveways. A Council Report will be considered at the Ordinary Council Meeting on 30 April.